A measure of bulk power; the equivalent of 1,000 kilowatts or 1 million watts; the unit is generally used to describe the output of a generator. Land-based wind turbine generators typically are rated in the 1.5-2.0 MW range. The Robert E. Ginna nuclear generator* in Rochester is rated at 498 MW. A measure of electric energy; the equivalent of 1,000 kilowatt-hours or 1 million watt-hours. 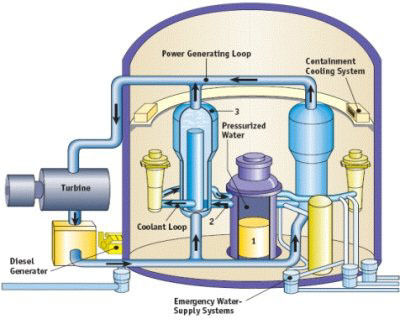 Megawatt-hours are determined by a plant’s capacity and how long the plant is running. A 1,000 MW power plant running at full power for one hour produces 1,000 megawatt-hours (MWhs) of electricity. If the plant runs all day, it produces 24,000 MWhs. A 2.0 MW wind turbine operating at full power 25% of the time (a questionably high estimate in the Finger Lakes) can be expected to produce 12 MWhs of electricity in one day or 4,380 MWhs annually. By comparison, the Ginna plant, operating at its average 98.6% efficiency, produces 491 MWhs of electricity per hour, which amounts to 11,800 MWhs per day or 4,310,000 MWhs annually, about the equivalent of 1,000 large wind turbines. However, Ginna's power is always online and is not dependent on how much or when the wind blows. In the graph below you can see that the Ginna plant currently produces about 10% of New York's nuclear electrical power. Cohocton's wind project would add/replace about 0.5% to that, at best. To add the equivalent of one Ginna plant would require 1000 turbines as noted above. Can you imagine the Finger Lakes region covered with 1000 or more wind towers, each as high as the hills they're on? And that would barely get us to nuclear's 1970 level. Sources: Energy Information Administration, State Energy Data Report 1999, and Electric Power Annual, Vol. 1, 2001, and EIA Survey Form 906. What about the larger picture? Current Fuel Mix for Electricity Generation in U.S.
Current total annual consumption of electric power in New York runs about 143,000 Thousand MWhs. 1000 wind turbines blanketing the hills of the Finger Lakes may produce as much as 4,380 of these or about 3% of this total. 50 wind turbines in Cohocton might produce up to 220 of these, or less than 1/6th of 1% of New York's consumption. Pretty puny power for all the expense, mess, and disruption. Perhaps instead of littering our environment, we need to be looking more seriously at other ways of conservation and less intrusive production alternatives. For instance, click here for an authoritative article about replacing greenhouse gas production with nuclear power. Wind farms, while an apparently appealing approach to some, are a classic example of what environmentalists call an "end-of-the-pipe solution". Instead of tackling the problem - our massive demand for energy - at source, they provide less damaging means of accommodating it. Or part of it. The Cohocton project, by replacing energy generation from power stations burning fossil fuel, promises to reduce carbon dioxide emission by about 200,000 tons a year. This is impressive, until you discover that a single jumbo jet, flying from London to Miami and back every day, releases the climate-change equivalent of 575,000 tons of carbon dioxide a year. One daily connection between Britain and Florida costs nearly three large wind farms. Alternative wind technology permits us to imagine that we can build our way out of trouble. By responding to one form of overdevelopment with another, we can, we believe, continue to expand our total energy demands without destroying the planetary systems required to sustain human life. This might, for a while, be true. But it would soon require the use of the entire scenic landscape of the US. © U.S. Nuclear Regulatory Commission (used with permission).